The authors regret for the mistake in Fig. 1. We have now revised the structure by the addition of oxygen atom in the saturated moiety. The authors would like to apologize for the inconvenience caused. Download high-res image (278KB)Download full-size image. Figure 1. Chemical structure of tocotrienol and its benefits in various diseases. Tocotrienol is a biological active form of vitamin E found in human diet. Recent research has demonstrated anti-thrombotic and anti-tumor effects of tocotrienol in addition to its wound healing properties and hence is a potential therapeutic target for the treatment of several human diseases. Kanchi, M. and Shanmugam, M. and Rane, G. and Sethi, G. and Kumar, A.P. 2018. 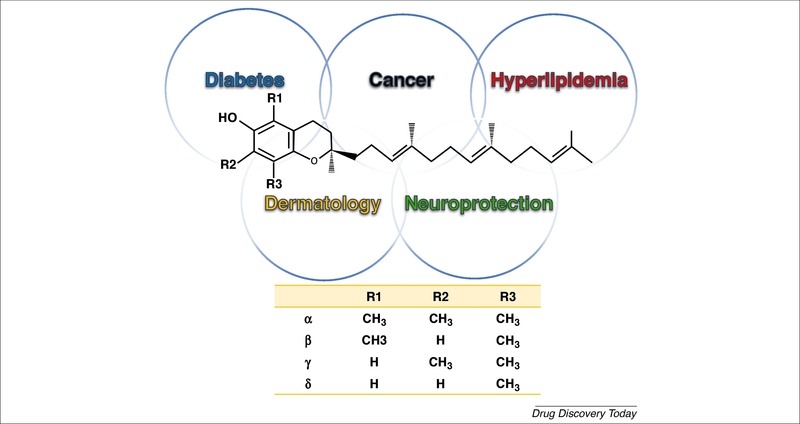 Corrigendum to "Tocotrienls: The unsaturated sidekick shifting new paradigms in vitamin E therapeutics" [Drug Discov. Today 22 (December (12)) (2017) 1765-1781]. Drug Discovery Today.